The Ancient Egyptians wore very light clothing made of linen. The most wealthy Egyptians and members of the royal family wore the finest linen. This linen was frequently washed and for a radiant finish the clothing was bleached and starched. The linen clothes of the richest women was so fine that it was transparent. 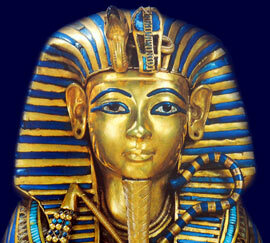 The jewelry provided the vibrant color to the fashionable Egyptians. The Ancient Egyptians wore many different types of jewelry, many items were light and delicate. But the pectoral form of jewelry was a large, heavy and elaborate piece of jewelry worn on the chest which often took the shapes of falcons and scarabs. Pectorals of gold inlaid with precious stones were owned by both royal Egyptian men and women which were created using the cloisonne technique where the outlines of figures and symbols were connected with gold wires that were then soldered to fine sheets of beaten gold and later inlaid with precious stones or faience. The purpose of these unusually large pieces of jewelry might seem somewhat obscure. In order to form a correct judgment, we have, however, to remember in what fashion the women of ancient Egypt were clad. They wore clothing which consisted of a kind of smock of semi-transparent material, which came very little higher than the waist. The chest and bosom, neck and shoulders, were bare; and the one garment was kept in place by only a slender pair of straps or braces. The rich clothed these uncovered bare parts of their anatomy with jewelry.